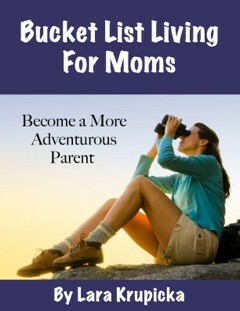 I’m so pleased to welcome the author of Bucket List Living for Moms: Become a More Adventurous Parent, Lara Krupicka! I’m a huge believer in “bucket lists” and was so pleased to be asked to interview Lara and learn more about this intrepid writer, journalist, and mother. Welcome Lara. Q What’s so special about bucket lists? A bucket list is a non-threatening way to think through what exhilarates you and which aspects of exploration and adventure are most appealing to you. Not everyone’s list is going to be the same. Different things interest each of us, which makes creating a bucket list an exercise in self-exploration. Then acting on those goals can take our lives in so many different directions. Plus, it can be powerful to talk about bucket list longings with those we love. When everyone is encouraged to be vulnerable and honest, it can be eye-opening to learn what those around us really want to do and see in life. That knowledge gives us opportunities to bring encouragement and support to our family and friends. There are plenty of relational benefits to creating, sharing, and accomplishing bucket lists with others. Q Why a book like this for moms in particular? In a family, Mom usually comes last, to the point that many of us end up sacrificing our own identities in service of our spouses and children. We no longer remember what we like to do for ourselves – for enjoyment or self-improvement. The overall homogeneity of modern moms (irrespective of actual parenting practices) is troublesome. So I wrote this book as a guide for helping moms get ideas on how to uniquely care for themselves, to model for their kids the importance of continuing to go after your dreams, and as a means to prioritize their goals for spending what time they have to invest in themselves. Q Don’t moms have enough to do these days without adding in a bucket list to worry about? It’s true. Moms today are very busy. But with most of their time and attention going toward their children, I think every mom deserves a bucket list of goals they look forward to completing. A list prepared with care will be motivating instead of anxiety-producing and will be individualized enough to skirt the competitiveness that often sneaks into the realm of motherhood. Not only can it be invigorating and refreshing for a mom to complete a bucket list goal, but also the benefits extend out to her family and her relationship with her kids. In other words, a good bucket list should be a life enhancer, not a stressor. Q What was the personal or professional lesson it took you the longest time to learn, and why? It took me a long time to learn that my words matter. I blogged for a few years and had very few readers, which was frustrating, but not unexpected. Somehow I assumed that no one would want to read what I was writing. And yet I kept on writing because I could not keep from sharing my stories. Even after a number of my articles were published, I still did not think I had anything worthwhile to say. Part of the reason I took so many years to get into writing was because of that self doubt. Finally I decided that maybe my experiences weren’t so boring or unique. I still have a tendency to stick to “safe” subjects, but my writing is much more self-assured. I am thankful for the readers who have chimed in to say how my stories put their experiences into words or how my writing has encouraged them or helped them in some way. That knowledge – that my words do matter and can make a difference in the world – has given more depth and meaning to my work. I am so glad I learned that lesson. Q What about bucket lists for dads, kids, or other people? Family is a great setting for living out your life longings. Dads tend to be a little clearer about their goals in life for the most part, but even still every dad should create their own bucket list. Kids, because of their natural curiosity about the world, have lists of things they want to do (learn how to skateboard, be tall enough to ride a rollercoaster, etc). They just do not formalize them as bucket lists – and why would they when “kicking the bucket” is far from being top of mind for them? Again, I would still encourage kids (and really anyone) to write those down. If nothing else, writing down your dreams makes them more likely to happen. I am also a big advocate for the family bucket list – a list of things a family wants to do together before the children are grown. It is a great tool for being intentional about our family identity and making the most of those 18 or so years. Q Couldn’t people make a bucket list without having to read a book? Absolutely. In fact, I think all of us already have a bucket list of some sort. The problem is that most of the time it exists in our heads and we don’t act on it very often. Plus, the common concept of a bucket list tends to limit us to considering only travel goals. But a fulfilling list is more than that. In both of my books, Family Bucket Lists and Bucket List Living For Moms, I encourage readers to think through their dreams and hopes across their life and across a variety of categories. The result is they have articulated their deepest longings and pinpointed long and short-term goals; goals that are easy to achieve and those that will take years, along with goals that they would like to accomplish with other people. Q So, was being a writer on your bucket list? It was! I decided when I was about 6 or 8 years old (once I could formulate my own stories on paper), that I wanted to be a writer when I grew up. I took a few detours along the way, but never forgot that dream. And now here I am – living it! Q How does that work – being a writer and a mom? Like any working mom, I can‘t say that it balances perfectly. But writing in particular lends itself to fitting in the gaps of family life. Most days I write and take care of work details while my children are at school. Many times that bleeds over to dinnertime. Yet I am also free when my kids need me, like for volunteering at school or taking them to appointments and activities. Q Who would you say was your greatest mentor, and why? I have been so, so fortunate to have some wonderful mentors in my life. As a writing mom, I have to say Christina Katz has been a great mentor and coach. She has helped me hone my skills and sort through what I have to say that will have the most impact. Under her tutelage I have gone from being a hopeful writer to professional journalist. What makes her such a great mentor is that she never stops pushing me to do better, to take the next step. She is incredibly observant. Christina can often see before I can what aspect of my life needs to be poured onto the page to help others. And she is so practical with her advice. Q I suppose as a bucket list expert you have plenty of opportunities to live out your life dreams. Tell us what that’s like for you. I am an ordinary mom, with kids to feed and clothe, and a job to fulfill. Nobody is footing the bills for my adventures. But I have come to believe so strongly in the importance of doing what matters most, that it seems someone in our family is checking off a bucket list goal almost every month. The biggest reason for that is awareness. I am much more open to spotting opportunities to achieve goals – big and small. And I have my family in a mindset to jump on those opportunities as often as we can, which is a big deal. I learned the hard way that hesitating doesn’t help. It also doesn’t help to not be clear in communicating your desires. Our bucket lists have given us a tool to communicate better. Again, we are not out scaling mountains or traveling the world. With our family’s temperament, we could not handle that pace. Instead, most of our days are pretty ordinary. We just do not let too much time go by between trying new experiences. And we don’t try to cram it all into school breaks and summer vacation. I find there are so many great adventures we can have right at home, that we don’t need to put everything off to vacation time. Q As a writer, what advice would you give to new writers who are coming up the ladder? Stick with it. Keep on writing. That blog you write may not get many visitors, but it may be honing your voice. Your first novel may get rejected over and over. But your second might be a big hit. The learning curve in the world of publishing is a long, steep one so you have to be committed for the long haul. And don’t buy into the scarcity mindset – that someone else’s success in writing comes at your expense. Be supportive of other writers and you can build the kind of camaraderie that will sustain you along the path to becoming a published writer. Q From your own bucket list, what is the biggest goal or your most favourite goal that you have left to accomplish? I cannot wait to spend time in the Tuscany region of Italy. Everything I have seen and heard about it sounds ideal in so many ways – the scenery, the food, the history. I have been studying Italian on the side and watching as many movies filmed in the region as I can find. At some point I want to read up on Italian history. It may be a long time before I get there, so I want to be prepared to make the most of every minute I will have once it arrives. David Meltzer was at the top of his game in the business world as CEO to sports super agent Leigh Steinberg (played by Tom Cruise in Jerry Maguire). He worked alongside Hall of Fame Quarterback Warren Moon and lectured around the globe. But something was missing, and the multimillionaire went on a rapid downward spiral that ended in bankruptcy. It was only then that David realized in order to revive and thrive he needed to blend spirituality with business. 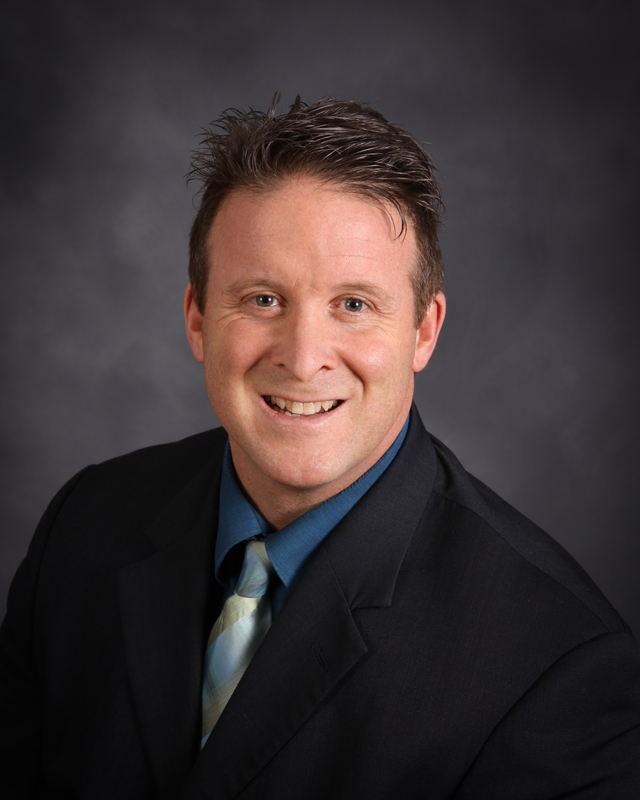 The result of his transformation is his remarkably successful venture, Sports 1 Marketing, and the debut of his new book (coauthored with Harrison Lebowitz) Connected To Goodness: Manifest Everything You Desire In Business and Life. Q: There are lots of books on today’s market that talk about personal empowerment, positive thinking, and defining with clarity what it is you really want out of life, work and relationships. What do you feel best distinguishes your own approach to this topic? A: I take a pragmatic approach. 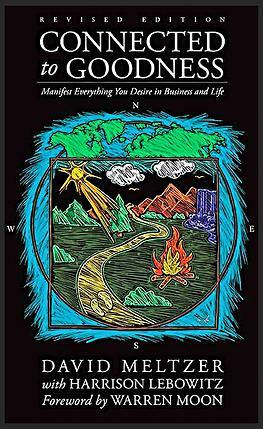 I’ve tried to take very complex spiritual, religious, and business beliefs and organize and collate them into a pragmatic, step-by-step process to follow in order to manifest what you desire rapidly and accurately. Q: What in your background gives you the credibility so that others will listen to your message? A: I have degrees, awards and accolades, been in executive positions and still, I believe my main credibility comes from the “dummy tax” that I paid … the lessons that I’ve learned through experiencing life and overcoming the mistakes that I’ve made along the way. Q: At what point in your life did spirituality become a core element? It blew me away that not only could she read my energy, but she used language identical to what I had heard from others who had begun to peak my interest into spirituality. Dr. Sahi turned out to not only be a medical doctor, but also a holistic accelerator of healing, and a practitioner of Quantum medicine. She offered to work with me. I immediately participated in one of her workshops where I could learn about Theta meditation and healing …which completely changed my life for the better. Q: What was your belief system prior to that moment? A: Prior to then, I believed that I was in control of my destiny and could overcome any obstacle that I faced. Now, instead of going out and getting what I want, I attract it to myself with no resistance. Q: How and when did you decide to incorporate spirituality into your business practice? A: When I became comfortable with Theta meditation and healing, I started incorporating these aspects of manifestation into my business practices. This happened in my late 30’s. Q: I’m assuming this transition didn’t happen overnight? A: You’re right. Gaining gratitude and empathy and strengthening a connection to goodness that had weakened takes time and has an accumulative effect. Q: Let’s talk about intuition. In your view, is it an inherited trait or a learned behavior? For instance, why is it that some individuals when faced with a challenging decision always seem to have a hunch, listen to an inner voice or just “know” which choice is the right one? A: We all have an inner voice and an intuitive sense to make the right decision based off of our awareness. Unfortunately, sometimes our subconscious – our ego – gets in our way and weakens our connection to goodness. We must then “Cancel” the negative chatter in our head, “Clear” our minds and “Connect” to goodness. Q: Do you believe that faith – and whether it takes the form of religion or spirituality – is increasing its influence in the 21st century or losing it? A: Because of the faster vibration and the complexity of what we’re exposed to, I think we’re losing our faith as we lose our awareness. Collectively, we have weakened our connection to goodness. Q: You’ve indicated there are seven interconnected principles that have a combination of general and specific relevance to our personal and professional lives. Which of these do you believe had/have the strongest bearing on your own success? A: The Foundation Principle. Knowing and understanding my personal, experience, giving and receiving values affects everything I do. Like everything else in the world, without a strong foundation, things are unstable. This also is the Foundation for all of the other Principles in my book. Q: Has it been difficult or easy to “keep to the code” of those principles? A: All good habits are hard at first and hurt, then they eventually get easier and easier. Based on the core of my belief system and principles as well as my philosophy on how the imagination works with the higher mind to create inspiration, the more we do something, the easier it gets as well … be it swinging a golf club, working on a relationship, manifesting financial success and so on. Q: Tell us about the different life or business stages you’ve identified in your chapters. A: The life and business stages are the same. The life stages are simply the macrocosmic view of the more specific microscopic components that embody the life stages, such as business. As discussed under the Destination Principle, these stages are: Skivers, who lack empathy and gratitude; Strivers, who are themselves empowered; Drivers, who are empowered and can empower others; and Thrivers, who are empowered and can empower others to further empower others. We need to be aware of when we weaken our connection to goodness. This loss of gratitude and empathy leads us to the stages of: Arrivers, who are self-entitled; Divers, who have an even weaker connection because of self-sabotage; and Survivors, who are just going through the basic motions of living and deciding whether to exist or not. Q: What is the greatest leap of faith you have ever taken? A: Wow, this is a great question! I would say that the greatest leap of faith would be when I went to work for Westlaw right out of law school instead of being a “real” lawyer, as my Jewish mother said. Believing that the Internet was going to be a big thing, I went against the grain. Q: Complete this metaphorical sentence: Life is like ______________________. Q: Describe what the collaborative process was like in working on this book. A: It was a phenomenal process between Harrison and me. I would do the due diligence and research … and then organize and lecture on each chapter. Harrison would record it and then put it into his prose and voice. I would then edit it and re-adjust it into the clarity, balance and focus of my voice. And then it would go back to him in this circular fashion until we were both satisfied. Like everything else, with this second book we are seeing that it is getting easier and easier, and Harrison and I should be able to get out three or four books a year. Q: How did your book and training lead to your partnership with Internships.com and what is that all about? A: Utilizing my years of training others, travelling the world for speaking engagements, and my business model of empowering others to empower others lead to the creation of my internship program. For years, I had been trying to figure out how to monetize this internship program. Through one of our interns being more interested than interesting, we were able to attract internships.com and create a mutually beneficial relationship based off of the reasons, impacts, and capabilities of both companies. We co-developed the sports microsite that posts sports-related internship positions and provides training, certification and other opportunities, including a video training series based on the book and a link to our own Web Channel, The Inspirational Sports Network (www.tisnchannel.com). Q: If you were making a commencement speech to the next generation of thought and business leaders, what would your theme be? A: How empowerment leads to happiness. A: The official book launch for Connected To Goodness will take place on September 27th at 3:00 p.m. at the Barnes & Noble, Tustin, The Market Place, 13712 Jamboree Road in Irvine, CA. I’ll be there to sign books along with my business partner and great friend, Pro Football Hall of Fame Quarterback Warren Moon, who wrote the foreword. We’ll also have an informative discussion on how to bring out greatness in others and in yourself. We’d love to see you there if you can make it. 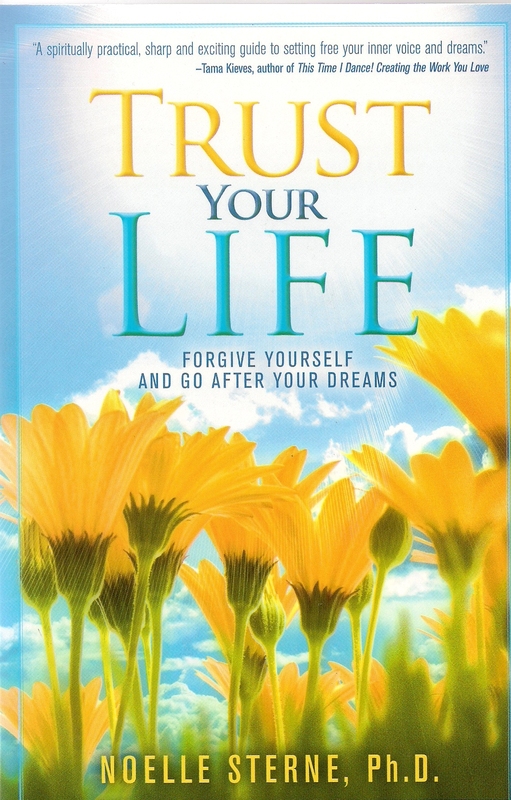 Besides Barnes and Nobles, both the brick and mortar stores and online, you can also get the book from Amazon or through www.connectedtogoodness.com. *Denotes awaiting confirmation of date. Please check www.connectedtogoodness.com for any changes. Finally, we anticipate the next book in this series coming out in January! As teens of any generation go through the painful process of individuating, it’s not uncommon that they either try to model themselves after the cool kids that belong to the “in” crowd or they fall into a state of despair that there is nothing unique about their own personalities or skill sets which will deliver the attention – and validation – they crave. Compounding the problem are parents who are trying to live vicariously through their offspring by pushing unrealistic expectations or those who lament that celebrities seem to have more influence on a teenager’s behavioral choices than any lessons imparted throughout childhood. In his recent interview with You Read It Here First, author and educator Daniel Blanchard talks about his new teen leadership series, Granddaddy’s Secrets, and the importance of being a positive role model for the young people in our lives. Q: The passion for helping young people find their way in a troubling world often stems from either having been influenced by supportive mentors throughout adolescence or, on the flip side, having no one to turn to and learning to overcome personal hardships through trial and error. What was your own background in this regard that shaped your career decisions as an adult? A: Believe it or not, some of my earliest role models that shaped my life were sport heroes that I watched on television. I would watch these amazing athletes do something special and then I would want to do something special too. The next mentors that entered my life were my athletic coaches. I learned a lot from these men. They were strong, skilled, and smart. These were the things that I wanted to become too. However, I am quick to acknowledge that I didn’t have enough mentors in my life growing up, and thus I felt that many times it took me twice as long to accomplish things. Even though we do learn from our mistakes, mistakes are painful. Teens should go out of their way to pursue mentors. Q: What’s the best advice anyone ever gave you when you were growing up? A: One of my early wrestling coaches told me after one of my losses that life was a marathon, not a sprint. And if I just hung in there, someday I will pass out these other kids that got an earlier start than I did in this sport. I did hang in there, and became very good over time, and eventually passes them all out. Q: There’s an escalating sense of “entitlement” among today’s tweens and teens – a mindset that has evolved as much from bad parenting as it has from political leadership that believes the have-nots are owed whatever the haves earned through hard work. What’s your response to a young person who has no role models in his/her life from which to learn an appropriate and disciplined work ethic? A: A young person has to start reading biographies of successful people. Here in these books they will learn how hard and how long these great people had to work for their success. Once they really get to know someone who has done something special, they will see that there are no handouts. Or at least now handouts that create any person of real quality. My first book, Granddaddy’s Secrets: Feeling Lucky? is a good example that explains how there are no handouts that could ever make one a real leader, and what many of our friends and society is doing is wrong. We need to think for ourselves, stand on our own two feet, and create our own luck. A: I’m tired of stars saying that they are not role models. They couldn’t be more wrong. They are role models whether they like it or not, so they better start behaving like role models because our youth is watching. I feel that it is our responsibility as adults to be those role models that our youth is looking for. And if we’re not big enough yet in their eyes, well then, we better get busy getting bigger, while we point them to real role models that really are doing something special and don’t behave badly. Finally, we need to open our mouths and tell our youth about the bad examples that celebrities are reinforcing. Let’s point out their bad behaviors and get it into our youth’s heads that that kind of behavior isn’t okay. If we can get our youth to start viewing celebrities’ bad behaviors as wrong, then maybe celebrities will think twice about what they are doing. Q: What inspired you to write Feeling Lucky? A: My students asked me over a ten year period to write the book. I finally broke down and wrote it. I figured they must be seeing something that I’m not if they are continuously telling me to write a book in order to tell other students what I’m telling them. So, I figured, why not have faith in them and do it. Q: How did you decide on the title for this book? A: I wanted to change the paradigm of luck being when one lazily sits back and waits for something good to come to them, to working hard and going out and creating good things in one’s life. The new definition of luck is preparation meeting opportunity. We create our own luck through hard work. I was hoping by calling my first book, Feeling Lucky? I can get people to think about what luck really is. Q: In a nutshell, what’s the book about? A: Granddaddy’s Secrets: Feeling Lucky? is about a struggling teen who lives in a rough neighborhood and goes to a rough school. On his 16th birthday he meets up with his estranged and mysterious Granddaddy who shares with him what it means to be a leader and a real man. Q: I understand this is part of a teen leadership series. Tell us more. A: Yes. My Granddaddy’s Secrets teen leadership book series has three books in it. The first book, Feeling Lucky? is the 10th grade story of a struggling teen who spends his 16th birthday in the park listening to his Granddaddy’s wisdom. The second book, Feeling Good, is the 11th grade story of the same teen who has grown from his Granddaddy’s wisdom and is now trying to apply some of these secrets of success and leadership to his own life. The third book, Feeling Strong! is the 12th grade story of the same teen as he is getting ready to graduate high school and take that next big step of going out in that great big world. Q: There can certainly never be enough books on the market to encourage young people to be independent thinkers, to stay positive, to be kind, and to make a difference as they go forth into the world. The question, though, is how do you get them to read these books – including yours – when there’s such a multiplicity of distractions (especially technological) to take their attention elsewhere? A: It’s always a struggle to get teens to read. However, the best way to get someone to read a book is still word-of-mouth. A teen needs to constantly hear us talking about these books like they are something really special. They need to constantly hear how books made a difference in our lives. If teens hear this kind of stuff enough, they will become curious and just may read these books that we keep telling them about. Q: Speaking of technology, is too much of a good thing actually a bad thing in a teen’s social development? For instance, is insularity and anonymity breeding a generation of youth that can no longer communicate in person or, worse, feel they shouldn’t be held accountable for anything hurtful they say via an electronic medium? A: Sadly, I do believe that that is happening to some degree. We adults remember what it was like to actually talk to people. We must go out of our way to talk to teens. They aren’t getting old fashion human conversations from most of their younger friends, so they need to get it from us. During these interactions we can build relationships with them and work on their communication skills, as well as their life skills, and let them know that they can’t hide behind electronics and say hurtful things to each other. Q: For youth between the ages of 10 and 24, suicide is the third leading cause of death in the U.S. and is prompted by feelings of stress, depression, inferiority, anger, or powerlessness. What do you tell a struggling teen who is overwhelmed by life’s unfairness and believes that the only solution is a fatal exit? A: Talk to an adult. Adults do care. In return, as I mentioned above, we adults need to go out of our way to constantly talk to our youth and build those relationships. No teen should ever feel that he or she does not have an adult that they can turn to. In addition, I also tell our youth that life drains us all, and all of us need to constantly fill up our emotional bank accounts. We fill up our emotional bank accounts by reading positive, self-improvement books, and by having great conversations and relationships with others. So whenever, life makes an emotional withdraw from our emotional bank accounts, we can handle it because we are always making positive emotional deposits back into our emotional bank accounts. By constantly doing this, we never let life emotionally bankrupt us. Q: What do you say to the parents of that struggling teen? A: You are the most important person in your child’s life. Don’t give up. They are listening to you, regardless of how they are acting at the moment. It may take years, but eventually, our youth will show us that they were indeed listening. A: I’m working on my third book of the Granddaddy’s Secrets teen leadership book series, as well as a second edition of my first book. A: They can check out my website, blog, and vlog at: www.GranddaddysSecrets.com. I also have a Granddaddy’s Secrets Facebook page they can visit and like. In addition, they can find my book on Amazon, as well as other major distributors. A: Teens, you are special. Life is a marathon, not a sprint. Don’t sweat it if you don’t feel like you’re winning the race at this very exact moment. Stick with it and you’ll do plenty of winning before your time is up. And when you are all grown up, remember the people that helped you get there, and make sure you return their acts of kindness to the next generation.